Here’s our latest Car Blog Showdown. This week tgriffith and jgoods were each invited to select their favorite mid-’80s 4×4. Which is your favorite? The famous 22R four-cylinder engine will run forever. Literally. You can drop it into 4WD without getting out of the truck to lock the hubs. The truck is easily customizable. Raise it to accommodate monster 36-inch tires, or add chrome accessories and window tint to create a classy truck! Leave the truck stock, and you’ll get gas mileage in the low-to-mid-20s. It’s a compact truck, but it has a tough-looking stance. It looks as good in a grocery store parking lot as it does tackling the off-road park. It’s a mini-truck – a “cute” truck. It does NOT go everywhere. Ignition problems have been reported. This is one tough truck, not one of them piddling little S10 babies. Get the V8, not the V6, which has plenty of power and durability, despite low gas mileage. The truck is a blast to drive on the dunes…and anywhere else you want to take it. The K5 is versatile and will handle loads of people, bags of feed, vicious dogs, and truck parts to repair your buddy’s ’84 Toyota Pickup. The styling is unmistakeable: Love it or hate it, this is the kind of vehicle GM built best. You’ll get something like 8 miles per gallon out of the V8. If the transmission hasn’t blown up yet, expect it to soon. It’ll probably happen on the freeway at rush hour. Then you’ll be THAT guy. It’s uglier and bulkier than anything else built in the 80s! What’s your favorite mid-’80s 4×4? Why? This entry was posted in Car Minded, CarGurus Features and Updates, General Chat, Trucks & SUVs, United States. Bookmark the permalink. I’ve actually owned both, and I like both, but I had a 1986 Chevy Silverado 4×4 with a 305 automatic and gas guzzling 4 barrel Carb that my mom had bought brand new in 1986 and gave to me…and the transmission was on its way toward going out when the motor finally had 2 rods to break at 182,000 miles….and it had been rebuilt at 140,000!!! ….and my current 1986 Toyota 4×4 xcab with its 22R and Weber 32 Carb. gets noticeably better gas mileage and it will go places that my Chevy would not. It’s easier to drive, I get more people commenting on it, some even wanting to buy it. Bottom line is the Toyota 4×4’s of the 80’s/early 90’s with that famous 22R/22RE engine are hard to beat, they will run,run,and run forever.I’m a Chevy fan too, I like Chevy Trucks, but I LOVE Toyota Trucks. Chevy’s best engine to me was the 4.3 liter V6 if it was in an S-10, but that 22R/22RE….nothing but pure toughness, it wasn’t built for horsepower or fast take offs, it was built simply to LAST and keep going. I’ve known people who’ve had Yota trucks with close to 300,000 miles on them and not even smoking oil. Companies today need to get back to making things SIMPLE , but with all of this computer stuff on cars/trucks….they know what they’re doing…they design things today to purposely start tearing up when they hit a certain mileage, they didn’t do that back in the 80’s, Corporate greed has ruined many companies. YEAH! Back to the Future is exactly why I wanted that truck so bad. Thanks for that link, Colin! Marty McFly. Back to the Future. 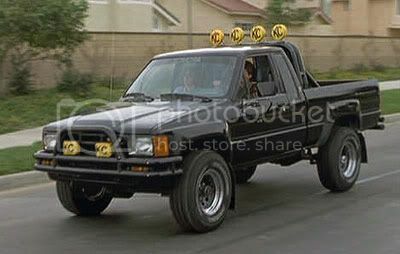 I remember watching that movie as a kid and wanting that truck so badly! I sure loved my shiny black ’84 K5. I don’t want to offend any of the blog readers who happen to be gay by repeating what we called Toyota 4×4’s back in those days. (Hey, we didn’t know any better!) You can see from Toyota’s current lineup that they did learn that they can’t compete with REAL AMERICAN TRUCKS unless they build ’em the same way. Count on tgriffith to unfurl his anti-American foreign car bias, even when it makes him look foolish, but can’t he make it look a bit less obvious? ← Will Chrysler’s savior walk away?